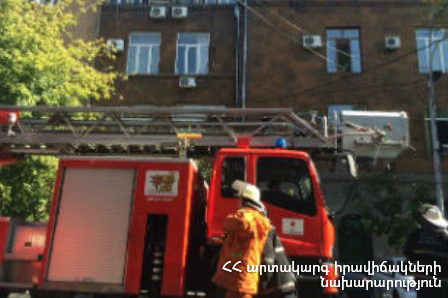 On February 6, at 13:45 an emergency call was received to “911” service that smoke was coming out of an apartment of building 1 on Azatutyan Avenue, Yerevan. The rescuers’ help was needed. The emergency response group of the National Crisis Management Center, three fire brigades and an autoladder from the fire and rescue squad of the rescue service, the duty doctor of the Center of Disaster Medical Treatment of MES of RA left for the scene. The fire was localized at 14:09 and extinguished at 14:19. A microwave oven, washing machine and a window burnt in the kitchen, as well as the walls were damaged.